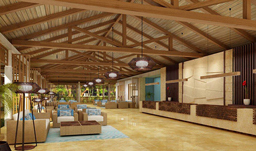 Experience the 5-star beauty of Melia Jardines del Rey. Located at the renowned Flamenco Beach in Cayo Coco, Cuba, this all-inclusive property is the perfect spot for relaxation, romance, and of course, fun! It features 1,176 rooms, world-class culinary options, a top-notch spa facility, and a wide-ranging activity programme. Imagine waking up to the inspiring views of the tropics, with the rhythmic melody of waves crashing onto the shore. For fun, Melia Jardines del Rey offers everything from Spanish lessons to tennis, and various watersports like kayaking and catamaran. After an exciting day in the sun, embark on a peaceful retreat to the YHI Spa. Indulge your senses in an array of massage treatments, and come home feeling thoroughly rejuvenated. At night, treat your palate to a taste of international, French, Oriental, creole, and fresh seafood flavours. Pair your dinner with a cold, refreshing drink as you enjoy a once-in-a-lifetime vacation with loved ones. To learn more about other Cuba vacation packages, speak with a tripcentral.ca travel agent who’s been there! Our toll-free number is 1-800-665-4981.